Skilled coaches helping your athlete master the fundamentals required to take your game to the next level! Perfect for hitting and pitching! 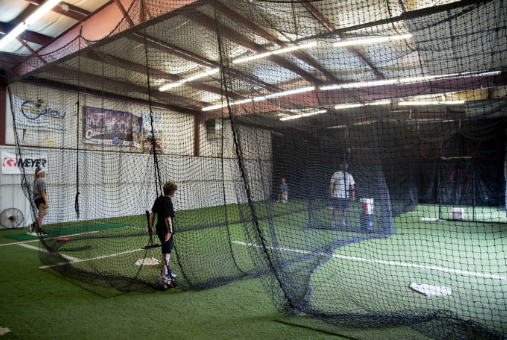 Our batting cages help teams and individuals get in a lot of reps in a little bit of time! Whether it's a birthday or end of the year team party, we've got plenty of room your kids to "have a ball!" Whether its baseball, softball, soccer, speed and agility or even football or golf, we've got you covered (literally). Our 40 x 60 indoor sports facility is covered in turf to give you the most comfortable and realistic feel while practicing indoors. With 3 retractable batting cages, the possibilities are almost limitless as to what you and your team or individual can accomplish. We host numerous sports camps, disc golf putting leagues, hitting leagues, birthday parties and more!